Looking down on the Bear River showing the main channel and old meander scars and oxbows. Ryhan Sempler is a Wetland Ecologist for the UGS where he has worked since 2013. When he is not out mapping wetlands throughout the state, he is typically working on shallow groundwater studies or on wetland assessment projects. 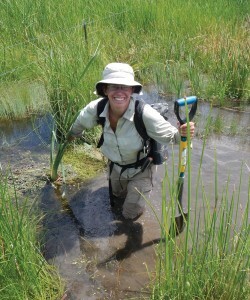 Diane Menuz has worked for the UGS since 2013 and is currently the Utah State Wetlands Coordinator. Her work focuses on developing the wetland program, managing wetland assessment projects, and determining how to meet wetland-related data needs for stakeholders in the state. Diane also has expertise in plant identification, species distribution modeling, and landscape analysis. 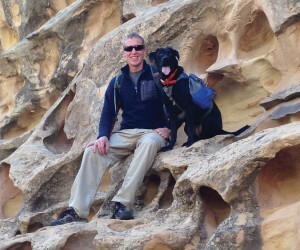 Rich Emerson joined the UGS in 2007 and is a Project Geologist in the Groundwater and Paleontology Program. 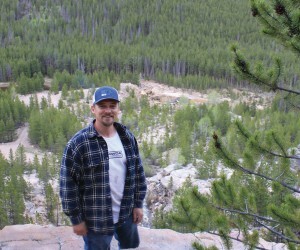 Since 2009 he has been monitoring wetland hydrology and, more recently, mapping wetlands across the state of Utah. Utah, the second driest state, has a steadily growing population and an increasingly scarce and vulnerable water resource. Wetlands are vital to protecting the quantity and quality of this resource as well as the quality of life for the state’s residents. There are many types of wetlands, but they are universally defined by water on the soil surface or by soil saturation at or near the surface that causes oxygen deprivation for vegetation for at least part of the growing season. Wetlands are integral for flood prevention, replenishing groundwater, improving water quality, and providing wildlife habitat. Wetlands are also popular for waterfowl hunting, fishing, wildlife watching, boating, and other recreational opportunities that provide public enjoyment and a boost for the economy in the surrounding communities. 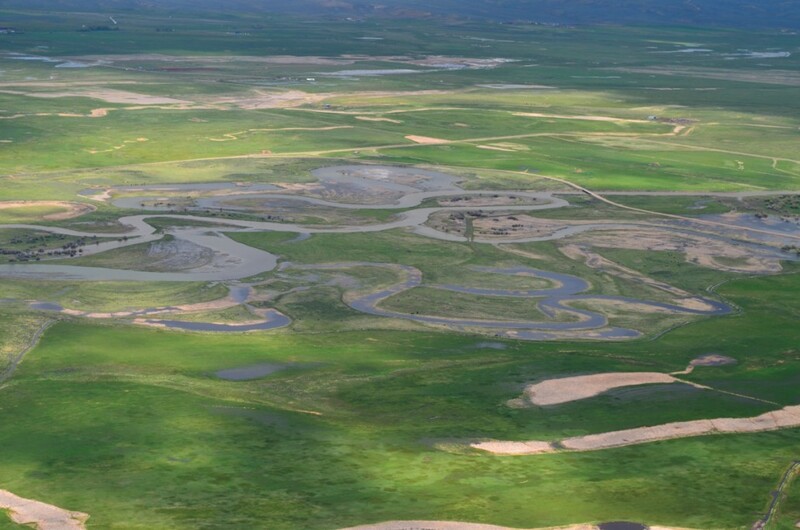 The Utah Geological Survey (UGS) has embarked on numerous projects to map and reclassify wetlands throughout the state to better understand their distribution, extent, and impact on the surrounding landscape. We recently mapped part of the upper Bear River watershed using the National Wetland Inventory (NWI) Program’s mapping standards and the Cowardin classification system. The Cowardin system uses an alpha-numeric code to classify habitat attributes such as water levels, vegetation, and landscape modification to describe wetland habitat. The Bear River is North America’s largest river that does not flow into an ocean, and it provides over 60 percent of the water flowing into Great Salt Lake. The upper Bear River watershed provides significant habitat for wildlife and livestock and supports the health and maintenance of the Great Salt Lake ecosystem. The upper Bear River project area extends from the entrance of the Bear River into Utah (near the outflow of Woodruff Narrows Reservoir in Wyoming) to its exit back into Wyoming (north of Utah County Route 30). Like most of Utah, wetlands in the watershed were originally mapped in the early 1980s using imagery and U.S. Geological Survey (USGS) topographic maps available at that time. Imaging quality has greatly increased since then, so remapping is important not only to track changes in land use, but because mapping can now be done at a finer scale. Our wetland mapping was conducted primarily with geographic information system (GIS) software, using a variety of geospatial layers including aerial imagery, the National Hydrography Dataset, and geotagged historical photos. However, fieldwork was very important for providing baseline data for interpreting imagery. The updated mapping showed a 71 percent decrease in wetland acreage compared to the original mapping. The original 1980s mapping effort classified 7 percent of the watershed as wetlands, whereas our updated mapping has only 2 percent of the watershed classified as wetlands. The biggest change in acreage, a 74 percent loss, was from areas in the valley bottoms, followed by the lowland foothills having a 49 percent loss. The Wasatch Range foothills and montane areas had the lowest reduction in wetland acreage mapped, 30 percent and 1 percent, respectively. What is the cause of such a large reduction in wetland acreage? There are probably several factors at play. First, we found that much of the acreage originally mapped as wetland in valley bottoms is actually non-wetland fields that are artificially flooded for agriculture. Second, mappers in the 1980s may have had a broader definition of wetland than that used today. NWI mapping standards have been refined since the 1980s and some areas that are not wet enough to be considered true wetland may have been mapped in the 1980s. Third, there may be some true loss in wetland acreage due to changes in land use or regional drying trends. Note that the precise loss of wetlands over the past 30 years is impossible to determine due to changes in NWI mapping standards since the 1980s. Though it seems intuitive to have negative feelings about this drastic reduction of wetland-designated acreage, we suggest that the new NWI map will benefit wetlands. Due to limited financial resources, it is imperative that resource managers know where true wetlands are located when planning conservation efforts. Our new mapping provides greater spatial accuracy and improved resolution and detail. Very little of Utah is classified as wetland and our data can better address which wetland types are rare in the upper Bear River watershed and where conservation, restoration, and protection should be prioritized. Besides the overall reduction in wetland acreage, another significant change to the NWI map resulted in a more accurate tracking of beaver-inhabited streams. The original map only had 23 acres designated as being influenced by beavers, whereas we added an additional 101 acres. Beaver habitat is important to understand because beavers are a keystone species; their ponds slow the movement of water which allows suspended sediment to settle out of the water column, increasing overall water quality, and beavers alter the landscape in ways that increase biodiversity. The upper Bear River watershed wetland map can help restoration practitioners identify areas underutilized by beavers for possible reintroduction or restoration efforts. A third change to the NWI map is greater inclusion of streams and rivers (which were not adequately mapped previously) in addition to wetlands. The original map only included two riverine areas, the Bear River and a small intermittent drainage on the northern edge of the study area, equaling roughly 90 linear miles. We added approximately an additional 300 linear miles of seasonally flowing or perennial riverine waterways, as well as roughly 1,600 miles of irrigation canals or ephemeral riverine waterways. Many of the stream segments were adopted from the National Hydrography Dataset following new NWI standards. The inclusion of these features produces a more complete and hydrologically connected water network. By accurately demonstrating when and where water is available on the landscape, biologists can better assess wildlife movement and riparian corridors, leading to a better understanding of biological carrying capacity (the number of animals in which the habitat can support). Mapping the upper Bear River watershed is just one of many recent wetland mapping projects at the UGS. We are currently in the process of remapping the south, east, and north shores of Great Salt Lake, which contain roughly 75 percent of all of Utah’s wetlands, and we will soon start a mapping project in the Uinta Basin. Project by project, we are moving towards an up-to-date and more standardized map of wetlands and other aquatic features in the state.